I guess the post is from the QBN couple who were behind the Candle Light Sabotage Party. Apnar kichu ukti apottikor. Amra Canberrate shokole milemishe thaki. Shobar shukh dukkho share kori. R amar janamote ekhane jamat, shibir, BNP, awami jogoter kau nay. Thakleo tara tader political vab murti char dealer majhe rekhe bayre ashe. Jara apnar shathe shedin proteste onsho nayni, tader apni jamat bole akkha dilen. Je loktar shorir kharap ba tar aponjoner shorir kharap, othoba kono kaje basto chilo, apnar ukti take kotota hurt korese janen? boyosh 55 upor onek manush achen ekhane jara sharirik koste achen abong shay karone onek jaygay jete paren na. Tader degree nia apni oshonghoti prokash korechen. Akhon manush hishabe apnaki amra opritikor akkha dicchi. Upor Allah k voy korun, r shobar shathe hridrota rakhun. Kolush monke shundor korun. Amra canberrate shompurno akta apolitical environment gorar chesta korchi. Tay oneke onek kichu korar age chintavabna kore kore jate karo sentimente aghat na hane. Apni to shokol canberra bashike chagu boledilen. 2 din thakar oviggota dia apni erokom ukti korte paren na. Amder ekhane konodin kau erup ukti koreni ebong shobay shokoler shathe hridrota rekhe kaj kore. amra apnar kothagula menenite parchina. @ Kushodhaj Datta - > apneou bhai tube light, bujhen nah ken jei oita QBN couple??? Ei blog ta amar nojore eshe che but I haven’t shared my thoughts with anyone neither has anyone shared their thoughts with me. Probably because I keep to myself. apni apnar experience base koresen jader shathe apnar mela mesha.Otherwise you cannot possibly make these assumptions. Shobaike ek katare falayen nah. Jader shathe mishen tader proti shohanubhuti. I don't think even they deserve your generalization. Apnar pura blog pore tinta jinish mo ne holo. Mithyachari, bina jukti te ukti ar kotucharita. First paragraph: মননে শিক্ষিত কিনা সেটা জানি না. Shak diye mach dhakar ki dorkar. Jotoi disclaimer den, bolte chacchen/ bhabsen Canberra’r beshir bhag manush oshikkhito (certificates are irrelevant). Jotoi (সংশোধিত ও সংযোজিত) bolen, ami jani what u mean to say. Second paragraph: Mezban (chatga theke noi so I maybe wrong). Mezban is a way to thank people for their friendship and support at a personal level. It’s a dawat. Apnar bashai dawat dile manush ke hoyto charity te dan korte bolen but most of us don’t. That they have raised some money you should be appreciative. Canberra te keu magna kahiate jai nah. Hopefully no one comes to your house to eat MAGNA. 3rd Paragraph: 13 Feb BOM onujayi ‘প্রচন্ড গরমে’ chilo nah. 26.5 chilo. Hat dhorar jonno chomotkar weather. 4th para. কাউকে "জোর" করা হয়নি. Amara ki uttor Korea te bash kori naki? Keu kawke jor korar ki ase? Jekhane Awami league ke shah bag e access dewa hoi nai shei khane Bd embassy te program ? Seriously! 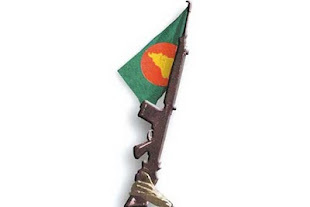 Shahbag is neutral ground. It goes against the whole principal of the movement. 5th para: jamati ra (I don’t know anyone personally) Jodi eto organized hoe, Apnara keno nah on such an important issue? BAAC theke ekta email office time e? Kudos to jamat for being so organized. 6th para. (অবশ্যই সবাই না,সংশোধিত ও সংযোজিত). Disclaimer. As if that would placate the intention of your post. You know very well kader ke apni uddehsso ko re post ta likhsen. We’re not stupid. Manush ke uttokto kora ei blog tar udessho jotoi কাউকে আঘাত করে থাকলে আন্তরিক ভাবে দূঃখিত bolen. its plain and simple. General comments: Canberra bashi kipta nah based on the general population. Ami chinta kore dekhlam 60% manush jaderke ami chini do charity (more, but I have never asked- just what I know). Bektigoto bhabhe scholarship sponsor kora, flood ar garments agun dhora niye taka tola, food stall ar ganer onushtan diye taka tola, gorib attiyo ar bondhu der jonno poisha tola, local charity’r jonno chul kata, hata, moch rakha, school er fete e ongsho ghohon kora ettadi ettadi ettadi. Hoyto apni jader ke chinen tara ko re nah. Ami jader ke chini tara ko re.Maybe I know a better class of people. Apnar blog is offensive, not representative and its quite bhasha bhasha. Amio ekta bahsha bhasha kotha boli. This is not only your blog post. Apnake keu canbera’r manshuke choto korar jonno ei blog ta likhte utshaho deyese. People with intolerance have no place here. I came here to avoid that. Jamatira may have a different point view but (hopefully their leaders get punished), but I welcome it in a free society. Deshe choila jan and help there. You would better serve Bangladesh in Bangladesh and not here. Blogs like yours are like Amar desh reports. Void of facts and divisive. Canberra te beshi din nai and I don't know a lot of people. Amar bektigoto dharona apni manush hishabe temon shubidhar nah and I think people who know you might feel the same way (অবশ্যই সবাই না,সংশোধিত ও সংযোজিত). Bektigoto akromon nah just a generalized view based on your blog. We’re not that bad. Why be divisive. if you were more proactive and intelligent in organizing maybe you would have gotten the result you were after. Ebong notun projonmo niye borai koiren nah. Read about the X and Y generation values and traits. 55+ year olds have much more to borai about then u and I will ever have. ৩) আপনার জন্য গরম না হলেই সেটা অন্যদের জন্যও যে গরম হবে না সেটা কি ভাবে ধারনা করেন? আন্দোলনটা নিজের চারপাশ থেকেই শুরু করুন না কেনো ?